Off message but another great walk from the free Essexwalks.com site. "Bumbles Green" is within spitting distance of London. It is only 30 minutes drive from Newham and like most walks just outside London, incredibly quiet and peaceful. 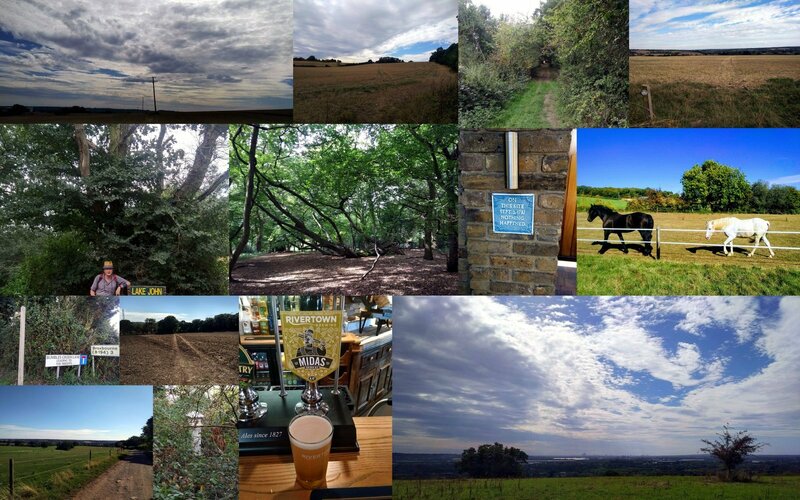 Early on the walk you pass a 19th century "Coal and Wine" post (picture next to pint of beer in collage). The City of London was able to levy taxes on these goods so such posts used to be placed on all access points to London. I suspect that locals at the time had a similar attitude to modern day Amazon.com to taxes so I am not sure how successful such posts were.? Check out the photo in the college bottom right, where on the ridge there some spectacular views of London (click on it to enlarge). A great place to have a picnic. There are remains of military bunkers on the ridge which I suspect were anti-aircraft gun platforms to protect London during the second world war. The walk is only 6.5 miles and while it has some hills there is nothing too severe. Other points of interest on route is a massive market garden nursery, which we finally managed to work out was growing courgettes and a huge mobile caravan park which appears to have been allowed to turn itself into permanent housing. I note an advert for a two bedroom caravan at the site going for sale at £199,000. If that does not convince you how ridiculous London property prices are what will? Many years ago Gill and I were walking in this same area and watched scores of travellers racing ponies and carts up the hill. A magnificent sight to us although I understand afterwards that the local landowner may have had a different opinion. Unfortunately the King Harold Head pub mentioned in the walk description as somewhere to seek refreshment has been turned into a rather snooty restaurant and when we turned up after the walk to see if we could have a drink we were turned away with disdain. Nevermind, I was able to get a lovely golden beer elsewhere (The Plough in Sewardstone).